Fertilizing To Get A Lush, Beautiful Lawn. It's a fact that beautiful lawns and landscapes come from a combination of sun, soil, water, fertilizer and good old fashion hard work. While SprinkleRite® can't help you with the sun, soil and water, we can make the chore of fertilizing and feeding your lawn and landscape as easy and simple as using your sprinkler system! 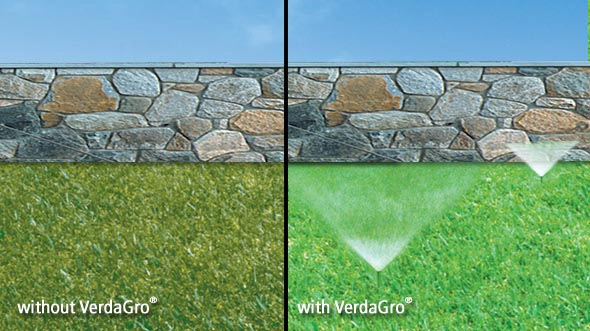 Now you can grow a beautiful lawn and landscape by automatically fertilizing through your irrigation system with the SprinkleRite® System and VerdaGro® Lawn Fertilizer. The SprinkleRite® Irrigation Tank System uses micro-dosing technology to allow grass and plants to absorb up to 90% of sprinkler dispensed fertilizer which helps build deep root systems, promotes plant health and keeps your lawn looking vibrant all season long. The SprinkleRite® System uses the same micro-dosing technology principle that has been utilized in commercial agriculture, horticulture, golf courses and sports fields for over thirty years. SprinkleRite® micro-dosing technology works by spoon feeding tiny amounts of VerdaGro® NPK 18-3-3 liquid fertilizer gradually over time to help stimulate root growth and aid in over-all plant health. The result is a thick green lawn with less effort and hassle. So take the time and effort out of fertilizing your lawn by using a SprinkleRite® System and VerdaGro® Fertilizer. Install a SprinkleRite® System today, so you can spend more of your time enjoying your yard rather than fertilizing it!